Jefferson United Church of Christ has its roots in the German Reformed Church, an early Protestant denomination brought to this country by German and Swiss immigrants in the 18th century. Originally organized as the Reformed Church in 1827, the church shared a building with the Lutheran Church until both congregations built their own houses. The original church building, a plain brick structure, was dedicated on August 21, 1841. A Sunday School room with an outside entrance was constructed by excavating an area under the altar of the church. Rev. George W. Willard served as the first pastor of the Jefferson Reformed congregation. In 1872, dedicated parishioners had a pipe organ installed and added a 100-foot tower with two bells that could be heard into the Middletown Valley. A Sunday School building was erected next to the church in 1900 and building continued in the 1920’s and 30’s with the addition of four classrooms and a kitchen. The main edifice was beautified with Memorial art windows in 1953. The Lenora Stockman wing was added to the church school building in 1985, providing two more classrooms, a choir room, a heritage room, pastor’s study and secretary’s office. The Nina Thomas Library was completed and made available to the members in June 1987. 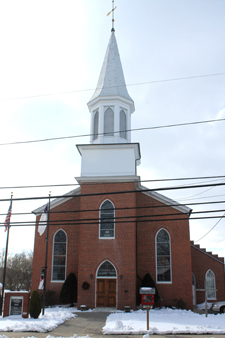 Through denominational mergers with the Evangelical and Reformed and the Congregational Christian churches, the Reformed Church in Jefferson became the Jefferson United Church of Christ in 1957. The church building is now a Frederick County Historic Landmark.